IRVING, Texas — Instead of caps and gowns and long speeches, a graduation ceremony in North Texas over the weekend featured wagging tails and wet doggy kisses. Fourteen Texans, including three from Houston, took part in the Canine Companions for Independence® graduation ceremony in Irving. 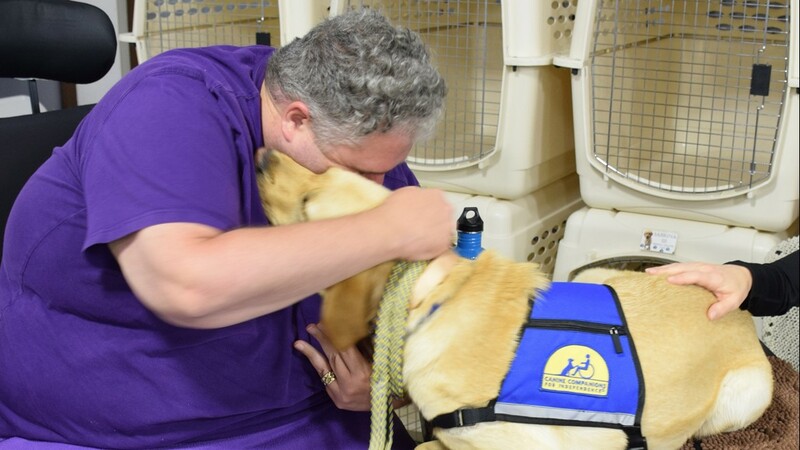 The adults and children received highly-trained assistance dogs to enhance their independence and quality of life. The dogs go through two years of extensive training before they are turned over to the people who need them. Chris Newbern, from Conroe, has a rare form of muscular dystrophy called sporadic inclusion body myositis or Sibm. With his new four-legged partner Powers, Chris will be less reliant on loved ones for daily tasks likely opening doors or picking up dropped items. Chris believes Powers will also break down some of the social barriers that come with being in a wheelchair. Bradley Muzechenko is a former first responder from Huntsville who learned about Canine Companions for Independence from his neurologist. Bradley has a degenerative disc disease which caused spinal stenosis and herniated discs. Bradley’s service dog Rowan will allow him to lead a more independent life by opening doors, turning lights on and off and picking up items he needs. Rowan can also bark on command to alert Bradley’s neighbors or family members if he needs help. Tomball resident Maryellen Bunn was injured as a flight attendant and is living with a traumatic brain injury. She says her life has already approved dramatically since her service dog Brahms came along. He has enhanced her independence and confidence by opening doors, both literally and figuratively. She feels more comfortable speaking to people in public with Brahms by her side and he helps her with balance while walking. Chris, Bradley and Maryellen made up the largest class to graduate from the Canine Companions for Independence since its opening in November 2015.